Toledo, OH – Ohio pro-life activists who were conducting their usual outreach on the sidewalks outside the Capital Care Network of Toledo last spring could hardly believe what they were seeing. A commotion alerted them that something was very wrong. It was Saturday, April 1, 2017, but by the frenzied activity, they knew this was no April Fool’s joke. With cameras at the ready, a local pro-life activist snapped photos as an abortion patient was taken out the back door of the of the abortion business. Witnesses on the scene told Operation Rescue that she was doubled over in pain and walked only with assistance. The suffering woman was loaded into the back seat of a dark maroon Ford Focus, Ohio license plate #GLH8725, which local activists said belonged to CCN employee Schuyler Beckwith. 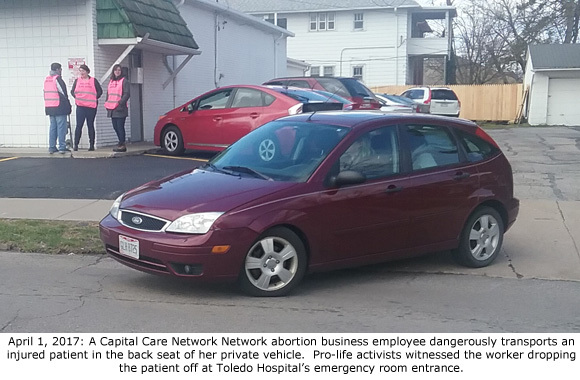 Another alert pro-life activist followed the private vehicle to Toledo Hospital’s emergency entrance, where Beckwith dropped off the woman, then returned to the abortion business. One local pro-life supporter has filed a complaint about this dangerous practice with the Ohio Department of Health, but there is no word yet on any outcome of that complaint. Certainly, most abortion facilities do not want anyone to know when one of their “procedures” goes awry. They attempt to conceal the fact in a number of ways to keep anyone from knowing the truth about the abysmal abortion safety record, which Operation Rescue has attempted to document over the years. Keeping medical emergencies secret allows the abortion businesses to continue spouting their patently untrue propaganda talking points about abortion safety and the burden that “unnecessary” abortion safety laws put on women. But the Capital Care Network has an added motive for trying to hide abortion complications so serious they require emergency hospital intervention. They have no valid hospital transfer agreement within a 30-minute driving distance, and are therefore in non-compliance with abortion facility licensing requirements. Unable to obtain a transfer agreement with a local hospital, Capital Care submitted an agreement with University of Michigan Health System in Ann Arbor, Michigan, which is 52 miles and nearly an hour’s drive away. In order to comply with the regulation that the hospital no farther than 30 minutes away, Capital Care’s owner Terrie Hubbard ridiculously promised to helicopter patients that suffered from abortion complications to the hospital in Ann Arbor. Now we find out that instead, CCN is sneaking women out the back door, dangerously transporting them to Toledo Hospital in private vehicles, and kicking them to the curb at the emergency room entrance! In 2014, after a full year of notice, the Toledo abortion business was ordered by the Ohio Department of Health to close, because it could not meet the licensing requirements for surgical abortion facilities. Since then, the Capital Care Network has engaged in a series of legal — and apparently deceptive — tactics to keep its doors open. A lawsuit filed by Capital Care that claims the hospital transfer agreement requirement is unconstitutional will be heard before the Ohio Supreme Court on September 12, 2017. Capital Care’s policy is to call 911 in the event of a life-threatening emergency where a patient needs immediate treatment. . . The responding EMTs will transport the patient to the hospital nearest to Capital Care, most likely Toledo Hospital. Patients experiencing less serious medical complications who do not need immediate treatment will be transferred to UMHS at by helicopter or vehicle. There is no mention of cramming an injured woman into the back of a Ford Focus and secretly dropping her at the emergency room. The statement about CCN’s emergency policies in their Merit Brief is simply untrue. It is also the position of CCN that if their abortion facility cannot meet licensing requirements, the requirements themselves must be unconstitutional because closure would violate the undue burden clause. No matter how dangerous an abortion facility’s conditions and practices are, it can never be closed for safety reasons, because any closure would create an undue burden on women. This puts the interests of dangerous and deceptive abortion businesses like the Capital Care Network first. The lives and health of women are a secondary consideration, if they are even considered at all. Capital Care is claiming to have the right to endanger their customers simply because closing it would force customers to travel a bit farther for abortions. The Ohio Supreme Court has an opportunity to put an end to that ludicrous argument and place the safety of women ahead of an abortion business’ contrived excuses for holding themselves above the law.